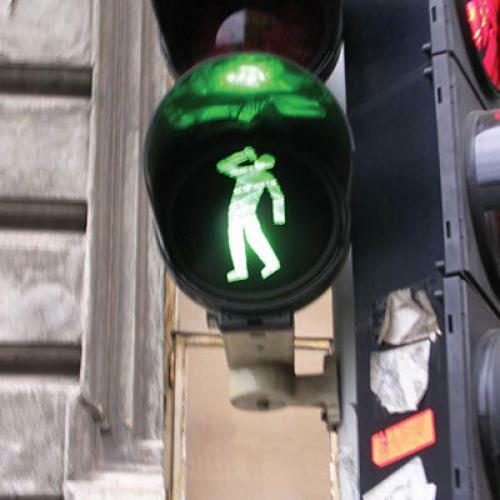 In April 2007, Czech artist David Hons replaced the human silhouettes in 48 Prague crosswalk signals with figures engaged in decidedly less pedestrian activities. One signal depicted a man urinating; another had a bottle raised to his mouth. A man squatted to defecate; another appeared to be falling down drunk. “I wanted to show people, they don’t have to walk or stand when the system says so,” Hons wrote on his website. A Prague municipal court found Hons guilty of vandalism, fined him $3,750, and ordered that he come up with an additional $5,000 to repair the signals. Hons paid for the repairs but refused the fine, explaining that he was merely expressing himself. Last December, he was sentenced to a month in jail. “I feel that paying the fine would be similar to signing an agreement to collaborate with the [secret police] in the era of totalitarianism,” the 37-year-old artist wrote in a statement published in the Czech newspaper Lidové noviny shortly before he entered prison. Hons isn’t the only dissatisfied Czech citizen who has recently made his frustration public. In May 2010, as the country was preparing for a nationwide election, Roman Smetana, a 29-year-old bus driver from the city of Olomouc, defaced some 30 campaign posters, scrawling, “Liars,” “Idiots,” “Corruptioneers,” and “Prostitutes” across them in Magic Marker. After the election, the victorious center-right Civic Democrats took legal action. Smetana was found guilty of vandalizing private property, fined $800, and ordered to perform 100 hours of community service. He complied with the fine (to avoid debt collectors) but resisted the second half of the punishment. His graffiti, he told the court, “was the free expression of opinion by a citizen who, unlike political parties, does not have huge funds for publicity at his disposal.” For refusing the community service, he was sentenced to 100 days in jail. Yet this month, Smetana refused to show up at the prison to begin his sentence; he could now spend three years behind bars for defying the court’s orders. ARTISTIC DEMONSTRATIONS of discontent have a storied history in Czech politics. The psychedelic rock group Plastic People of the Universe was widely seen as subverting Communist rule with their music, and their 1976 trial—for “organized disturbance of the peace”—inspired Vaclav Havel and a small group of dissidents to draft Charter 77, the civic initiative insisting that the Czechoslovak Communist regime respect basic human rights. The most famous example of Czech protest art, however, came 15 years later. Early on the morning of April 28, 1991, a 23-year-old art student named David Černý ascended the World War II–era Monument to Soviet Tank Crews in Prague with a group of his friends and painted the green tank bright pink. Although originally erected to commemorate the Soviet liberation of Czechoslovakia from the Nazis, the tank had become “an occupation symbol,” the artist recently recalled when I interviewed him. The police promptly arrested Černý, and under pressure from Moscow—which would not remove the last of its troops from the country until June 1991—the Czechoslovak government ordered the tank repainted. Ten days later, making use of their parliamentary immunity, a group of Czech and Slovak deputies, all former dissidents, again covered it in pink. The “Pink Tank” has since become one of the country’s most celebrated acts of anti-Russian defiance—and is now the precedent to which the vandalism of Hons and Smetana is being compared. Hons, according to the Czech Helsinki Committee, is operating within Černý’s legacy but has received less nuanced consideration from the government. “It was unimaginable that the state would have responded by criminally prosecuting [the painting of the tank] as vandalism without taking into consideration its artistic and political dimensions,” the organization argued. James Kirchick is a contributing editor for The New Republic and World Affairs Journal and a fellow with Foundation for Defense of Democracies. This article appeared in the April 19, 2012 issue of the magazine.